This W.I.P shot of the construction site in Jungle Road, should give you an idea of how i plan to recreate these kinds of scenes. The road here loops around the construction shack and heads back the other way. Just out of shot, the road actually splits at a Y (when coming from the monorail terminus) and continues to the left of the screen and runs parallel to the monorail supports, adding a bit of variety to the levels progression and follows a more realistic path through the terrain. Players are free to explore as far as they could in the original level, maybe even a little further, with a lot more detail everywhere of course. The Wooden construction shack is just an Out-House structure that i’ve covered with some lianas to give it the appearance of overgrowth. All outside objects and structures will have a layer over top that can be toggled, so they have a layer of overgrowth like this automatically applied. That way i can have a model for a section of monorail track that can be placed up in the air on some supports (out of reach of the plants) or on the ground covered with overgrowth, adding a lot more visual variety to everything. The monorail supports are just some wall components that i will replace later with actual models. They will vary a little in size and condition and there will also be a lot less of them upright, with some of them fallen over or just not built yet. There will be some sections of monorail track that will be in place on the supports, and players who are observant and observant will find ways to get up on them and possibly find some hidden items. ~ by newoldmate on 06/09/2012. Looking good, espacially those monorails segments. Thick jungle is great but maybe you sholud consider adding some tree-empty high grass areas near roads. Everything looks as it should so carry on. Looking good man! Keep it up! The NK used for scale almost makes we wish they were in the game so i could see someone else attacked for once instead of the dinos all trying to eat me. I have a full story that includes other people on the island. It takes place in recent times and sees two guys travelling to the island after one of them received information regarding its location as well as photos of some poaching of the dinosaurs that was taking place. The two men travel by plane to the coordinates they were given and while circling the island they see some activity on the beach. They see someone who looks like they are in trouble and as the circle for a better look, their plane is shot at and the pilot is hit. The plane continues out of control towards the island and clips the top of one of the mountains, which causes damage to the plane and results in the door to being blown out, scattering their equipment over the island below. The plane then slams into the ocean and the player wakes on the beach, their friend having died in the crash. The level structure would be very similar to how it is now, following the same path for remake purposes, but there would be lots of new elements. The people who shot the plane down are poachers who have been killing the dinosaurs and cutting off their heads and feet for black market sale. They were once shark fin poachers who found the island and have been there for quite some time. 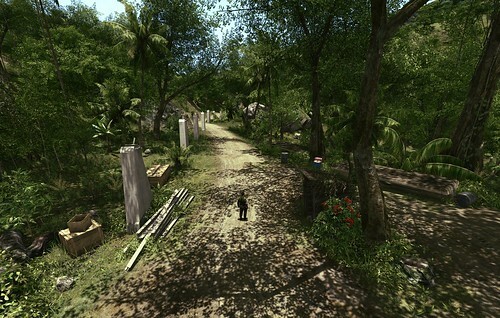 The player would be given the option to observe or engage, while they try to solve puzzles and progress through the island. 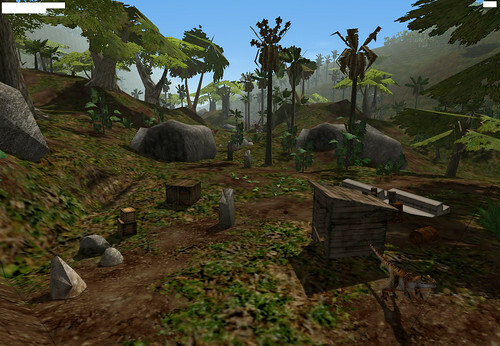 Certain puzzles would require the player to retrieve items from the poachers makeshift camps, giving them the choice of either stealth or action. The idea was that the human element (the poachers) would always remain an optional objective throughout the game, never once would they be the primary mission objective. That way it wouldn’t compromise the feeling of being alone on the island, upsetting the feeling of the original Trespasser. I still have all these ideas and concepts, which could be easily adapted to a “Trespasser 2” after this is finished. That sounds awesome, also the idea of a second sounds great as i would love to see what you would do without trying to remake the trespasser experience. I can’t help but think of the rough idea of Jurassic park 2 with InGen coming to yoink some dinosaurs, i would like to play as them and capture a pet dinosaur… or maybe just poach them lol. I’m so excited to watch the progress and to see the upcoming posts.